This study investigated oxidative stress in patients with psoriasis of low and medium disease activity. We measured advanced oxidation protein products (AOPP) and malondialdehyde (MDA) in plasma using UV-spectrophotometry and high performance liquid chromatography connected to a fluorescence detector in 84 patients and 84 matched healthy subjects. AOPP is a marker of protein oxidation due to inflammation, whereas MDA is a hydroxyl radical initiated lipid peroxidation product. Clinico-demographic variables including age, gender, disease severity, and fatigue were assessed in relation to AOPP and MDA. 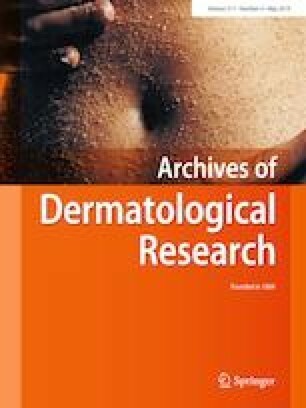 Disease severity was evaluated with the Psoriasis Area and Severity Index and the Dermatology Life Quality Index. Median (interquartile range, IQR) AOPP concentrations were 66 µmol/l (IQR 54–102) in patients and 69 µmol/l (IQR 55–87) in healthy subjects (P = 0.75). Median plasma MDA concentrations were significantly lower in patients than in healthy subjects (0.68 µM, IQR 0.54–0.85 vs. 0.76 µM, IQR 0.60–0.97; P = 0.03). Plasma levels of AOPP and MDA did not indicate oxidative stress in patients with mild psoriasis. Higher AOPP concentrations were associated with male gender, high body mass index, and high hemoglobin values. Elevated MDA concentrations were associated with advanced age and male gender. No associations with disease severity were detected. Although, the two selected biomarkers do not provide a complete measure of oxidative damage, our study demonstrates that a number of physiological and methodological factors influence the levels of MDA and AOPP. Such methodological issues are important to consider when interpreting results using these biomarkers in patients with psoriasis. The online version of this article ( https://doi.org/10.1007/s00403-019-01903-2) contains supplementary material, which is available to authorized users. Inger Marie Skoie received support as a doctoral research fellow from the Western Norway Regional Health Authority (WNRA, “Helse Vest”), Grant number (912015). This study was approved by the Regional Committee for Medical Research Ethics in Norway (REK vest 2010/1455). All participants provided written informed consent, and the study was conducted in accordance with the latest revision of the Helsinki Declaration.